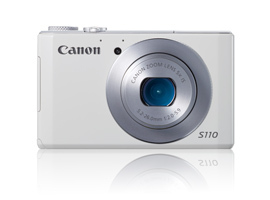 Smooth and modern, the Canon PowerShot S110 is a subtle update over its predecessor, the S100. This high-end point-and-shoot camera maintains the small stature from its older relative, making it easy for users to slip the device into a pocket. And like the S100, it continues to provide photographers with the duel image formats of JPEG and RAW. Looking past its exoskeleton, the S110 transplants the S100’s 12.1-megapixel CMOS sensor, its DIGIC 5 image processor, and essentially the same optics that includes a 24-120mm lens equivalent. The latter allows for photographing to photograph with an aperture f/2.0 at the widest focal length, and a more restricting f/5.9 aperture when zooming in at telephoto distances. The biggest difference between the S100 and the S110 comes from the latter’s adoption of mobile technology, a continuing trend among DSC and DSLR. For its part, the S110 now incorporates a 3-inch 460k-dot resolution touchscreen. This spec helps users toy with photo settings, creative filters, and edit. The device also includes built-in wireless, allowing users to upload images and video to their mobile devices, or directly to social networking sites. Oddly, this newer PowerShot S-series excludes the previous models built-in GPS unit. However, it offers users a free software download that lets S110 consumers record GPS data using their mobiles and then transfer and embed this information into their photographs via the S110’s new wireless technology. • Its 12.1-megapixel CMOS sensor. • Its DIGIC 5 image processor. • RAW and JPEG image formats. • ISO range of 80-12,000. • Three-inch LCD touchscreen with 460k-dot resolution and touch autofocusing. • Full HD 1920 x 1080 video with 24 fps filming.